How to activate your Ozeki SIP SDK license? This article shows you how you can activate your Ozeki VoIP SIP SDK in some easy steps in order to reach all the functions you need to create your own VoIP solutions. When you download the trial version of Ozeki VoIP SIP SDK you can use it with at most 2 registered accounts and 2 phone calls at the same time, and the trial information is sometimes activated during your calls. If you want to get rid of these uncomfortable things, you only need to buy a full version of the SDK. Ozeki provides you a wide selection of licenses, so you will surely find the best solution for your company without having to buy a more expensive product that is capable of a lot of things you will never use. In case of Ozeki VoIP SIP SDK you will only pay for the capacities you really want to use. When you decide to purchase an Ozeki VoIP SIP SDK license, you will get your serial number immediately via email and you will not need to download a new .dll. This means that you will be able to use the programs you have already written with the same .dll registered to your programs. 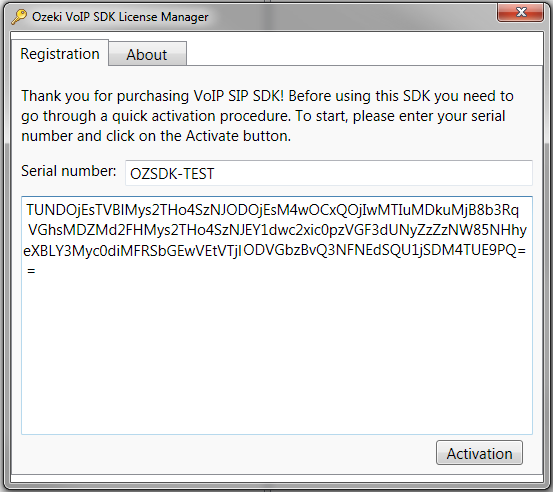 First, you need to download the trial version of Ozeki VoIP SIP SDK. For activating the trial version open the Ozeki VoIP SIP SDK License Manager. The License Manager will be found as a Desktop shortcut (Figure 1), or you can start if from the Windows Start menu too. When you start the License Manager, you can type in your serial number into the labeled field. If you set your serial number properly, you can press the Activation button and the activation code will appear on the window (Figure 2). At this point your Ozeki VoIP SIP SDK is activated and you can start to use your .dll with the full functionality you paid for. You will only need to write an additionally code line into your programs and they will be capable of work with the full SDK without changing the .dll reference. This line has to be added to the InitializeSoftPhone method as it is shown in Figure 3. The Ozeki.VoIP.SDK.Protection.LicenseManager.Instance.SetLicense method needs two parameters you need to set. The first parameter is your serial number, the second is the activation code that appears in the License Manager after you pressed the Activation button. You will need to copy and paste the full activation code as parameter in order to have your solution work properly with the full SDK. This guide has shown you the three easy steps you need to do when you want to activate your Ozeki VoIP SIP SDK. After the activation process you will be able to use your SDK with the full functionality you paid for and you can build your own VoIP solution with the extraordinary background support of Ozeki VoIP SIP SDK. Download Ozeki VoIP SIP SDK and start your project instantly!